Home SharePoint Online SharePoint Online: How to Hide "Create Site" Link? SharePoint Online: How to Hide "Create Site" Link? Requirement: Disable Create site link from SharePoint Online home page! 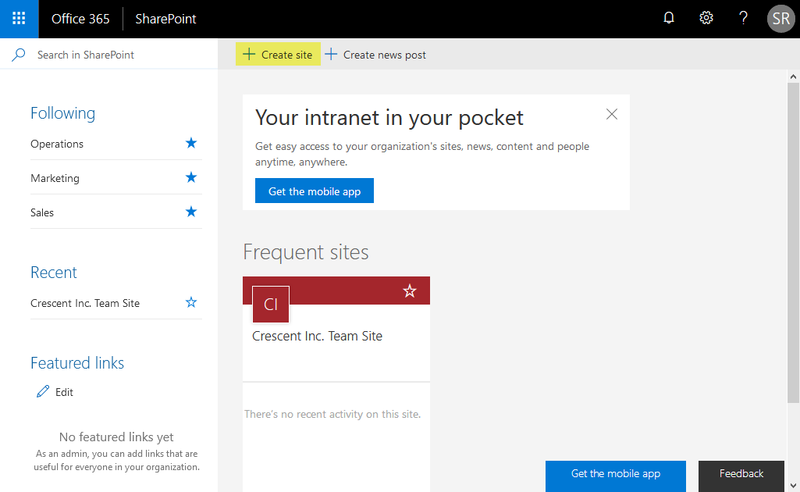 The "Create Site" link in SharePoint Online Home (https://crescenttech.sharepoint.com/_layouts/15/sharepoint.aspx) helps end users to create their own modern SharePoint sites. We got a requirement to disable this "Create Site" Link as a policy decision. How to Hide the "Create Site" Link in SharePoint Online Home? Under "Site Creation" section, select "Hide the Create site command"
Click on "OK" to save your changes! This hides "Create Site" link in SharePoint Online home page for everyone including administrators (Admins can create sites via SharePoint Online Admin center or PowerShell) once you logout and login back!